The large site to the south of Edward "Doc" Rickett's lab on Cannery Row has a long and perilous history. Originally a simple Chinese housing area associated with the better-known adjacent McAbee Beach, in 1916 the Bayside Fish & Flour Company built a small reduction plant at the site. This Japanese-run company operated throughout World War I and well into the 1920s before it was purchased in 1927 by the Cypress Canning Company. Within a year, however, it was transferred to Edward David, who founded the Del Mar Canning Company. David made a few additions to his cannery over the next decade, but disaster haunted the site and first struck on November 24, 1936, when the entire complex burned to the ground. Other casualties included the Sardine Products Company cannery, two warehouses, the Cypress Fisheries reduction plant, and Doc Rickett's lab. Damage was estimated at $750,000 and firefighters were called from all over the Monterey Peninsula to help suppress it. It was the biggest fire since the Associated Oil Pier fire in 1924. Left with cinders, ruins, and a large vacant property, David rebuilt and expanded his operation to both sides of the street. He built a modern cannery along the waterfront that rivaled Hovden in size. Composed of a primary cannery building, an adjacent warehouse, and a second warehouse across the street connected by an elevated conveyor, this facility was cutting edge. A late addition was a two-story, largely-detached reduction plant appended to the southern warehouse. The cannery, primary warehouse, and reduction plant all featured Spanish-style roofs and faux-stucco walls, which were plastered atop corrugated steel and simple wood frames. It created an impressive street-front, even if it largely resembled the other nearby buildings in style. Del Mar Canning Company, aerial view, 1937. 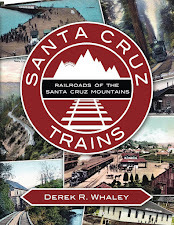 Across the street, a less-picturesque two-story warehouse was erected between Ocean View Avenue and the Southern Pacific Railroad's Monterey Branch right-of-way. A long, southward-exiting spur had been installed behind the warehouse site since at least 1926 when the Bayside Cannery still owned the site. 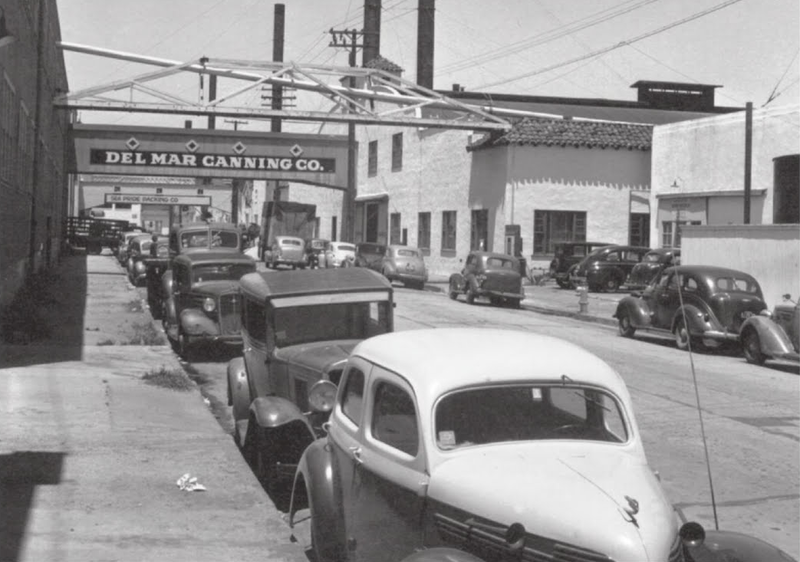 By the 1930s, the Del Mar Cannery shared the spur with the adjacent Monterey Canning Company. It accessed the track via a long loading platform that ran the length of the structure. Since the entire complex was later destroyed, no remnant of this platform survives, and even the right-of-way for the spur has since been built over. The depletion of the sardine breeding grounds after World War II led David to sell the Del Mar Cannery in 1947 to Westgate-Sun Harbor Canning Company, which continued the operation until December 8, 1951, when a second fire seriously damaged the complex again. 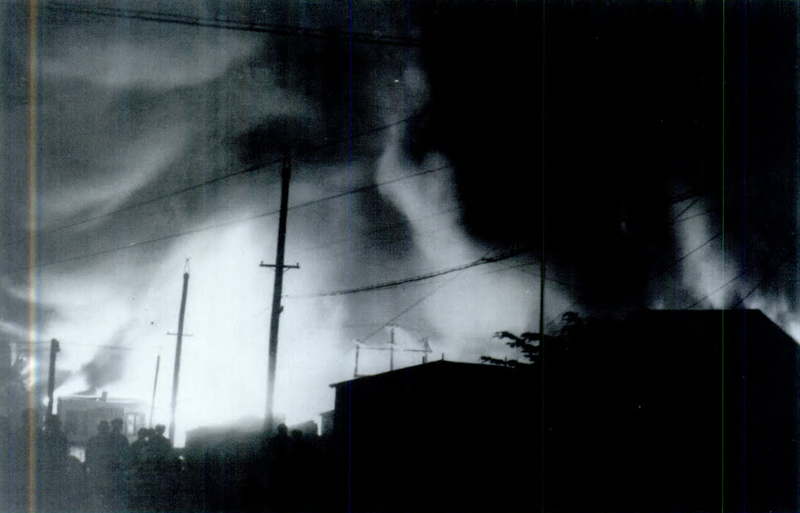 The two warehouses were destroyed, with fire running down the elevated access-way that connected them, expediting the process. Firefighters managed to successfully defend the three tanks of fish oil stored nearby, saving the primary cannery and the reduction plant, as well as protecting other nearby buildings. 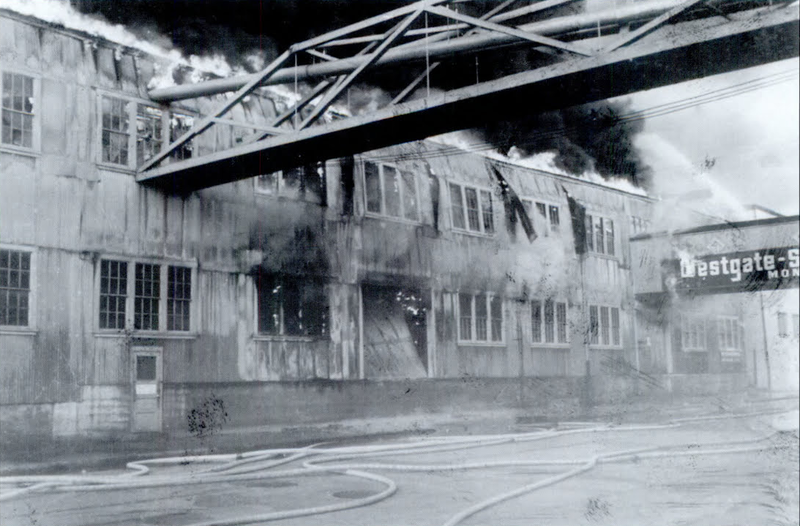 $1.8 million in damages was accrued from this fire, and another fire in 1952 further damaged the remaining structures of the complex, leading to the demolition of the cannery itself. 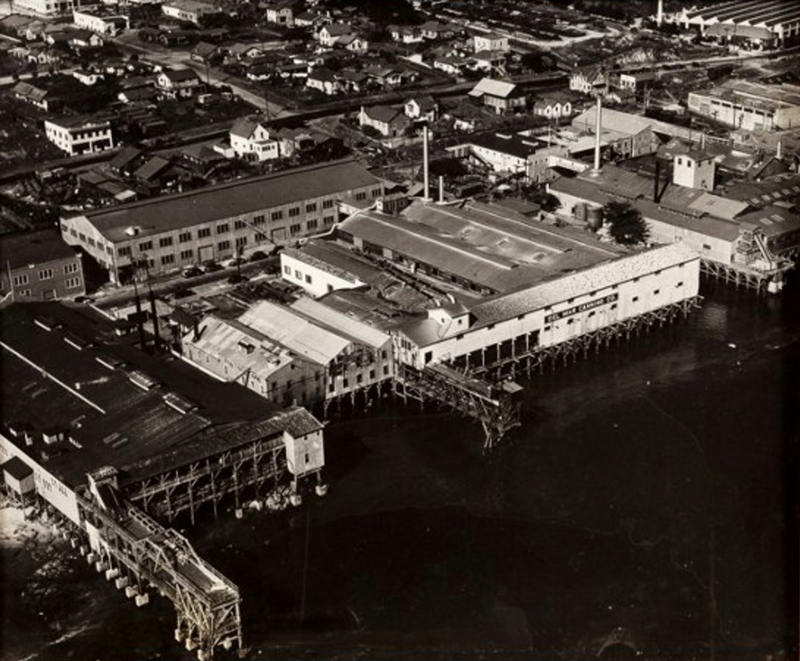 By 1962, the cannery site was entirely vacant except for the reduction plant, which sat idle. The small, detached plant was eventually purchased and repaired by new owners. Over the years, the building was upgraded and its façade was restored to its original stucco design, with significant alterations. The interior was gutted to make room for a restaurant. In the late-1990s, the Bubba Gump Shrimp Co. took over operations of the location and continues to operate a restaurant in the former cannery structure today. No other trace of this cannery survives and recent developments have erased any archaeological remains that had sat at the vacant sites for so many decades. Bubba Gump Shrimp Company with the InterContinental Hotel beside it. The only structure that survives of the Del Mar Canning Company is the reduction plant that is now the site of the Bubba Gump Shrimp Co. The adjacent InterContinental The Clement Hotel was built in the early 2000s and is situated atop the site of the cannery itself, which was demolished after the 1952 fire. Across the street atop the site of the two warehouses destroyed in the 1951 fire is an extension of the InterContinental Hotel, accessible from the main hotel via a newly-constructed second-floor overwalk. The hotel hosts a number of businesses on its ground floor including Nestle Toll House Café, the Monterey Mirror Maze, the Scheid Vineyards Wine Lounge, the Carmel Yacht Club, Z Folio Gallery, Sunglass Hut, California Classics, and the Shen Design Studio. Adkins, Jan Batiste. Images of America: African Americans of Monterey County. Charleston, SC: Arcadia Publishing, 2015. Architectural Resources Group and Architects, Planners & Conservators, Inc. "San Carlos Park". Primary Record. State of California – The Resources Agency. Department of Parks and Recreation. 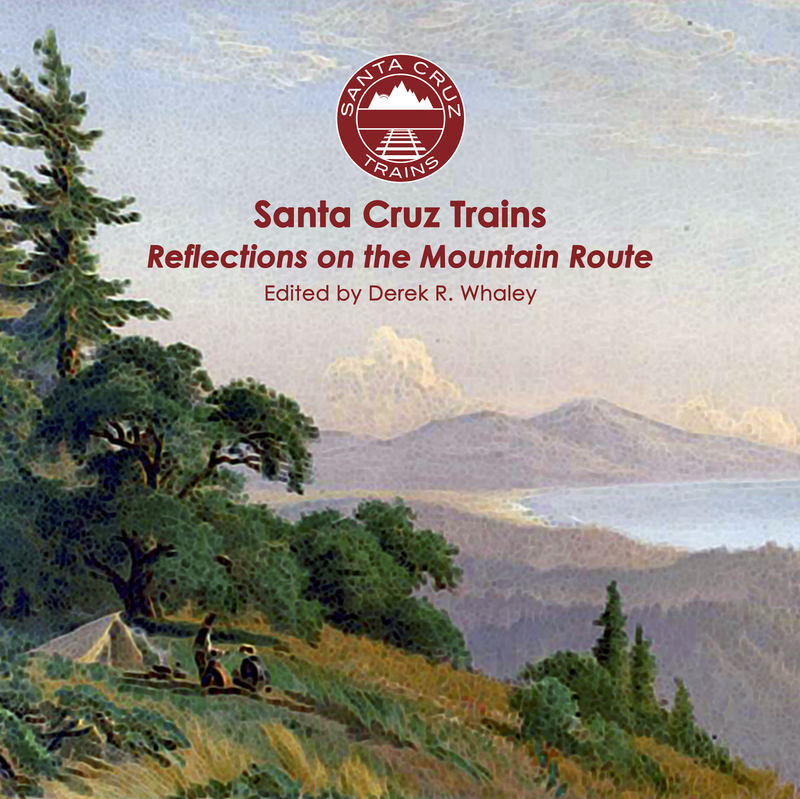 In Final Cannery Row Cultural Resources Survey Report Document, Monterey, CA, 2001. Ventimiglia, Mike. Images of America: Monterey Fire Department. Charleston, SC: Arcadia Publishing, 2012. So cool to learn all this history about a place I regularly visit. Thanks! I've just discovered your work here and I'm very impressed! This is all fascinating stuff, thank you for sharing it.